A former Marine and veteran of two wars, Brandon Raub was arrested late Thursday evening at his house in Virginia for inflammatory comments that he made on Facebook. The arrest was made by numerous FBI agents in conjunction with the Chesterfield County Police Department. Raub was not read his rights, according to numerous witnesses, and was initially taken to an undisclosed location. It has since emerged that he is being held indefinitely and without charges at John Randolph Psychiatric Hospital in Hopewell, Virginia. However, upon contacting the CCPD, Thomas was told that her son was arrested by the FBI, and that “[the arrest] was an FBI matter and [CCPD officers] were just there to assist them.” Additionally, the CCPD states that Raub has not been charged with either resisting arrest or assaulting an officer. Whether or not one agrees with the sentiments expressed by Brandon Raub, his defenders are quick to point out that what he has said on Facebook is not illegal, nor do his comments justify his indefinite detention without charges at a mental hospital. His mother reports that Raub is due to see a judge on Monday, but as of now still has no idea why he’s been arrested or held against his will. Civil rights activists are concerned that this arrest may be a sign of things to come under the government’s seemingly limitless power to detain American citizens without charges, as specified by the National Defense Authorization Act (NDAA), signed into law on New Year’s Eve 2011 by President Obama. The Obama administration has been engaged in a fierce courtroom battle over the legislation since a May 2012 injunction against the “indefinite detention” provision was issued in federal court. 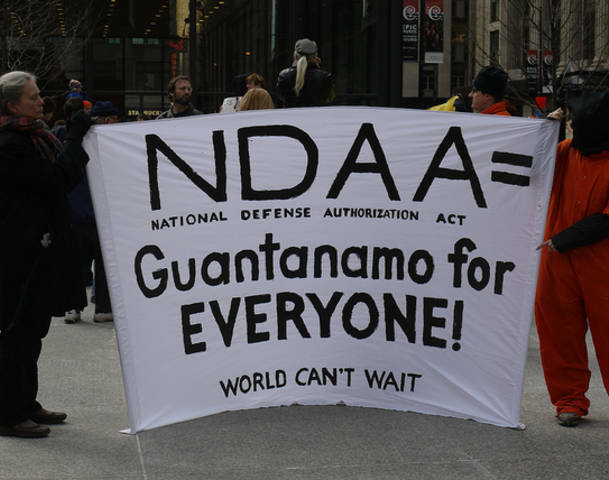 The injunction was issued after a lawsuit was brought against the federal government on behalf of such notable plaintiffs as Noam Chomsky and Pulitzer Prize-winning journalist Chris Hedges, which argued that the NDAA was unconstitutional. The White House, however, is challenging the injunction and demanding that their power to indefinitely detain anyone they deem a “terrorist” be restored. So despite a federal injunction prohibiting the Obama administration from acting upon the “indefinite detention” provision, could the arrest of Brandon Raub and others like him be the first sign of things to come in the new United States? And more importantly, what is our role now, as active and informed citizens of a democracy apparently under siege?